No knowledgeable boxing fan will argue against the assertion that any list of great current boxers would include the name Terence Crawford somewhere near the top of the list. The names on Crawford’s list of defeated foes are impressive and his record now stands at 34-0 with 25 knockouts. The following breakdown sheds some light on why Terence Crawford has been so dominant over his professional boxing career. Terence Crawford is a master technician in the ring. He never rushes when dissecting an opponent. He can punch for power in both hands and often switches back and forth between orthodox and southpaw stances. His offense is enhanced by his ability to move his head and upper body to elude punches while moving forward at this opponent. This gains great punching angles for Crawford while decreasing his opponents’ counterpunching opportunities. Crawford will often lead with a straight left hand from the southpaw stance. This often leaves opponents confused. All in all, the average fan has a tendency to underrate the offense of Crawford. However, his opponents will attest to the high-powered arsenal Terence Crawford possesses. Despite a natural tendency to be aggressive, Crawford has the ability of a natural counterpuncher. His elusiveness allows him to make opponents miss. He is then able to make them regret every errant punch they throw. Crawford’s weapon of choice when counterpunching is the uppercut. He is often seen ducking under a punch thrown at him only to quickly return fire with an uppercut. Terrence is also able to land uppercuts to the body or head after rolling with the punch of an opponent. Another favorite counter of Terence Crawford is the check left hook he throws after taking a half step back to avoid an incoming attack. Crawford’s athleticism makes it extremely difficult for opponents to land combinations against him. He uses his reflexes and movement of his upper body to avoid the majority of punches thrown in his direction. The defense of Terence Crawford is the equivalent of a top-notch security system. The only chinks in Crawford’s defensive armor come when he fights from the southpaw position. Straight right hands can be landed from orthodox fighters and right hooks sometimes land from southpaws when Terrence fights from this position. Crawford is very good at blocking punches when he chooses to do so. But in most cases, he finds it more to his liking to avoid punches with his upper body movement. Crawford has fought more from the southpaw stance in his last few fights. From this position, he likes to paw and probe at his opponent’s defense with his right jab. Crawford is often able to distract the man across from him with his jab and will cause them to second guess their next move. When his opponent jabs, Crawford turns his own jab into a defensive weapon and uses it to check the jab of his opponent. He is able to keep his opponent unsure of when his jab will be used to slap down the opposing jab and when it will be aimed at his opponent’s face. The final piece to the Crawford puzzle is his extraordinary footwork. He is almost never a stationary target in the ring and his opponents find it difficult to time his movements. Crawford uses his agility to constantly move from left to right and sometimes switches stances while doing so. His athleticism allows him to keep his opponent at a distance that favors Crawford throughout the fight. Crawford uses his movement to negate the offense of opponents who find themselves hesitant to throw punches. While opponents struggle to find their timing, Crawford is able to break them down with his own offense. Terence Crawford has few equals when it comes to showcasing his skills in the boxing ring. Many opponents have left the ring after a fight with Crawford more puzzled regarding the secrets to his ring prowess than they were before they entered the ring. Fortunately for fans, we can attempt to decipher the reasons behind Terence Crawford’s elite boxing ability without having to step in the ring with one of the greatest fighters in the game today. 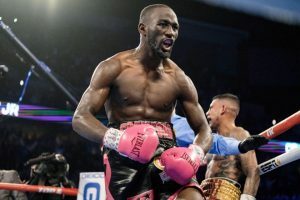 The post 5 Things That Separate Terence Crawford From Opponents appeared first on . Liverpool did not slip this time. They beat Chelsea 2- 0 and Salah scored the goal of the season !! Klopp on that goal and the game .. Highlights ..